The Mars Exploration Rover (MER) folks that operate the Spirit andOpportunity robots on the red planet have gotten some bad news. A directive has come from NASA Headquarters to take a 40 percentfinancial cut in their program ? some $4 million in the remaining months offiscal year 2008. It all comes down to a financial stun gun for one of therovers, both still busy at work doing science. Cost to run the Mars twinsis $20 million per year. 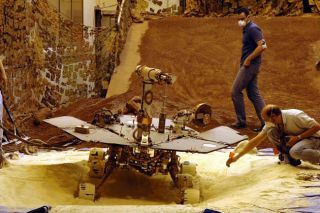 They've been on the red planet since January 2004 andare long past their 90-day mission plan. Steve Squyres, the MER principal investigator at CornellUniversity, said the 40 percent cut is huge. "We?re rapidly coming to the conclusion that if we have toimplement this cut, it?s going to mean essentially shutting off scienceactivities for one of the vehicles," Squyres told SPACE.com. Safely shutting down a rover on a temporary basis is doable,Squyres said, a move that could save money but at the expense of science. "We?re going to go off and look at what our options are ? but I feelconfident that we have to essentially halt science operations on one of the twovehicles." While both robots are healthy and doing good science, it lookslike the one to hibernate for the remainder of this fiscal year could be Spirit, Squyressuggested. The MER group has also been told to expect an $8 million cut infiscal year 2009. It would essentially be the same magnitude of cut. At thattime, it is expected there would be two healthy rovers both able to move, driveand explore. "We would have to make some very tough decisions about whichone we would hibernate and which one we would keep active. That?s a situation Ido not want to face?but that?s a future worry," Squyres added. For now, the message back to NASA Headquarters is that, if the MERteam has to take the first cut, there is going to be an impact on sciencereturn?and in fiscal year 2009, it will be much more severe. Squyres emphasized that the rovers are in good health and doinggood science. Another concern sparked by the budget cut, along with keeping therovers healthy, is keeping the MER team together and morale high, he said. SPACE.com has also learned that the venerable NASA Mars orbiter,Odyssey, is on the cost-cutting table, too. Odyssey has been in orbit since 2001.